Learn the basics of how to use the modular pattern. It is likely that many of the projects we create this quarter will follow this basic pattern. So make a note of this project so you can find it again later as it lays out several patterns that we are likely to use over and over. 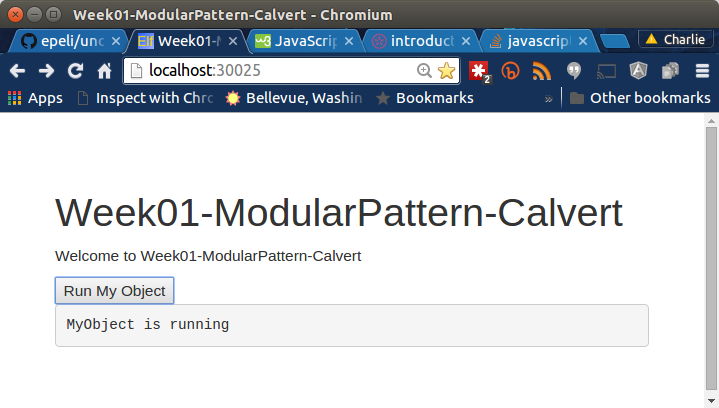 How to use the modular pattern, which provides public, private and instance methods. How to test code of this type. All the checks should be green. You should add this file to your repository so I can view it when I pull your work down. Also run grunt check now, and once again before you turn in the project. Make sure it comes back clean. If you run cat TestResults03.txt you should see that two tests passed. START - Start the server / do a single run. --port                <integer> Port where the server is running. --auto-watch          Auto watch source files and run on change. --no-auto-watch       Do not watch source files. --log-level           <disable | error | warn | info | debug> Level of logging. --colors              Use colors when reporting and printing logs. --no-colors           Do not use colors when reporting or printing logs. --reporters           List of reporters (available: dots, progress, junit, growl, coverage). --browsers            List of browsers to start (eg. --browsers Chrome,ChromeCanary,Firefox). --capture-timeout     <integer> Kill browser if does not capture in given time [ms]. --single-run          Run the test when browsers captured and exit. --report-slower-than  <integer> Report tests that are slower than given time [ms]. --help                Print usage and options. Open spec/fixtures/fixture.html to make sure it worked. In layout.jade, make sure you load my-object.js. In routes/index.js, set the title to include your last name. Submit your code in the appropriate folder of your repository. Make sure TestResults01.txt - TestResults09.txt are included. Also, make sure the code works when you run it.